1. To your high speed blender, add 2 C of soaked cashews & 2 C of water. Blend on high, add more water according to your blenders capabilities. Set aside 1 C worth of this mixture, you can use this at a later time, make a dressing, go wild. 2. Add the wedge of beet, fresh strawberries, vanilla, and sweetener (if you are using any, I personally don't). Blend again until a rich pink color develops. If you want the strawberry flavor to be more prominent then add some more! If you want the color to be more pink, then add more beet. 3. For the chocolate sauce, add everything to a bowl & whisk together. If you need to add more cocoa, add more, if the mixture is too thick then dilute it a bit with more hot water. Adjust sweetening to taste. 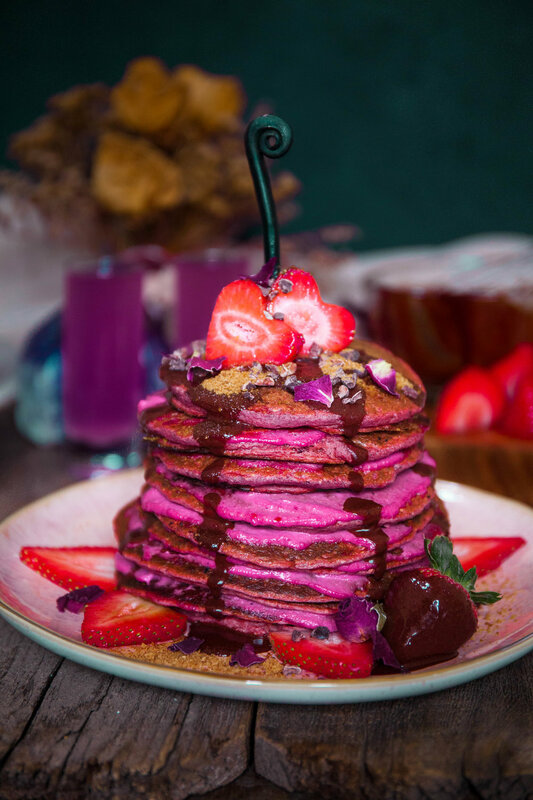 Recipe for the pancakes themselves is in my cookbook, RABBIT FOOD which can be purchased in my shop!